Reality is created by the mind. 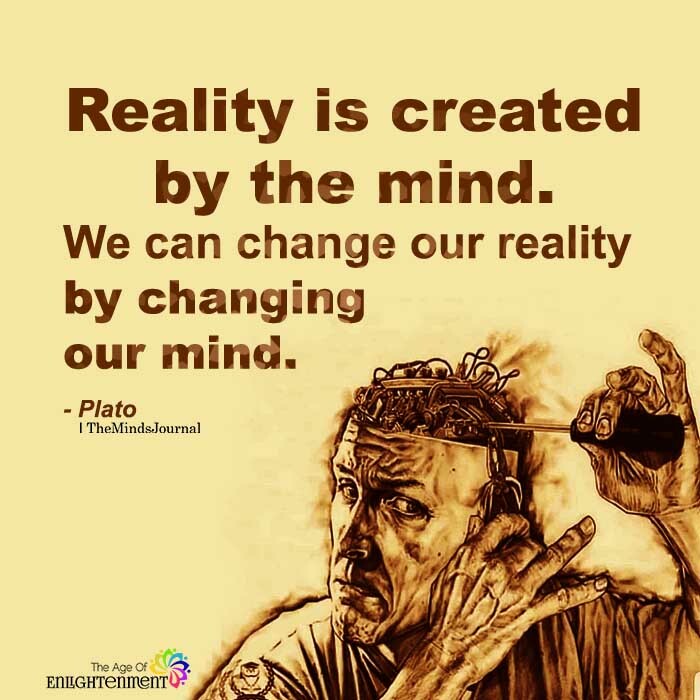 We can change our reality by changing our mind. Wrong! Reality is always reality! It is what it is! We can t have each of us its own reality :))))))))))) Unless you re crazy and see or hear things. But we do have our own reality. Your thoughts and actions make sense to you. But to the outside observer they do not because they do not know details. So the reality of your world is much different than the reality of his world. Your reality is real to you. That much you do know. But you dont know a thing about what that other person goes through in their reality. Please, open your eyes. Arguing details with Plato, a respected intelligent philosopher of old, is not a good look. Evan Gentelia That’s a bad argument to make. There are plenty of philosophers who could, and did argue with Plato. It’s not like he was the only authority on reality. Aristotle is a nice example. Literally one generation removed from Plato. Ayn Rand. Descartes. And as far as we can tell (unless you take hard solipsism as a given, which is undefendable, since why would you bother to talk to us if you did), there is just ONE solid reality. Scientific experimentation proves that facts of reality are always, testably and repeatedly true, no matter what your thoughts or belief systems are.